The words may have sounded jovial, and even hinted that the problem between the two parties could be resolved over a cup of tea, but in actual fact the issue is continuing to cause genuine chaos for the Nerazzurri. 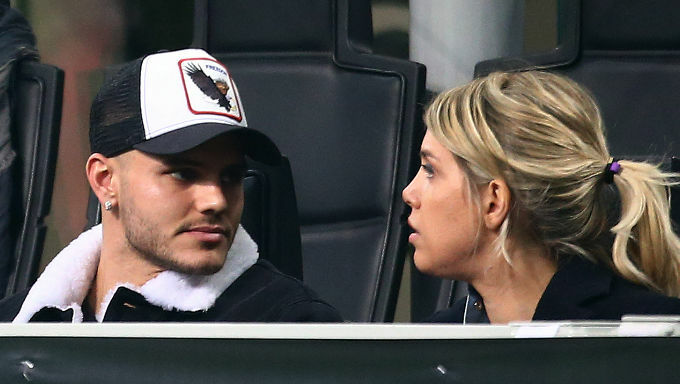 Even ignoring the fact that Icardi had already caused huge controversy by having an affair with, and subsequently marrying a former team-mate’s wife, before making her his agent – plus the rift caused between himself and the club’s Ultras due to statements he made in his book – recent events have become akin to a soap opera. The latest drama has been by far the worst as on February 13, Inter announced that goalkeeper Samir Handanovic had been handed the Captain’s armband. By the very nature of the statement, everyone knew that this meant Icardi had been stripped of the honour, and the star striker and his agent wife – who has repeatedly appeared on TV in tears – did not take too kindly to the news. Since then, Inter have played five matches without the man who fired in 44% of the team’s goals in Serie A last term, and with a 2-1 defeat to lowly Cagliari last weekend, the strain was beginning to show. “Knee Pain” is the Problem? The official reason for his absence was cited as knee pain, but with the club’s medics almost ready to declare the Argentine fit, it seems that he has no intention of taking to the field anytime soon. “I repeat, we were waiting for things to get sorted out,” Inter Coach Luciano Spalletti told reporters in his post-Cagliari press conference. Yet the latest reports suggest that Icardi will demand that the problem be operated on, which would inevitably keep him out of action for the rest of the season. All this may seem a little excessive for a man who is being offered a peaceful solution to the problem by the club, and who has been offered a place back in the side by Spalletti himself. However, this could be a typically drama-ridden ploy by the striker and his wife to force a move away this summer, their faux outrage over the Captaincy a perfect excuse to do so. The best bookmakers’ odds reflect this, with BetVictor offering transfer specials which will pay out 2/1 should Icardi move to Juventus, 4/1 for either Chelsea or Paris Saint Germain, 6/1 for Barcelona and 12/1 for Real Madrid. While Icardi is a former Barcelona youth team product, of all sides outside Italy it seems that Madrid would be his most likely destination, making this a good bet with a return of 12/1. Wanda Nara caused tongues to wag once again by placing a “like” on Los Merengues’ social media accounts this week, giving a strong hint that this would be their choice for the summer. Closer to home, the Corriere dello Sport newspaper has suggested that Juventus would be willing to discuss a swap deal involving Icardi’s compatriot Paulo Dybala, making this another great transfer betting option at 2/1. In the midst of all the mayhem associated with this player, it’s very easy to lose sight of exactly how good he is. Last term saw him finish as the joint top scorer for Serie A with 29 strikes, but statistics reveal he only took the 12th highest number of shots (101) to reach that tally. Indeed, since arriving at Inter in 2013, Icardi has fired in a staggering 122 goals in 210 total appearances, taking him to eighth in the club’s all-time top goalscorers list. Despite his achievements, it seems like Inter and their supporters have had enough of the baggage that comes with along with him. This makes those aforementioned bets of a move to Real Madrid or Juventus smart indeed, as the drama will inevitably be turned up to the max ahead of the upcoming summer transfer window.